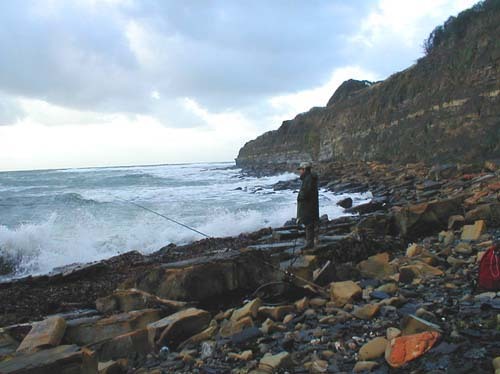 Rough seas are a frequent feature of sea angling. Sometimes it seems that 'somebody up there has it in for me!' Of course, when a force nine blows up, just as you have arranged to go to your favourite spot, there are usually alternatives. A quick spot of rescheduling can put you into a sheltered corner where it will, at least, be possible to fish. Often it may only be a matter of walking along the shore until the curve of the beach, a jutting ledge or an angle in the cliff face gives you the protection you need. With a bit of luck the fishing may be even better than you anticipated. The other day I had a classic example of exactly this. I gulped down my tea and drove down to the shore. 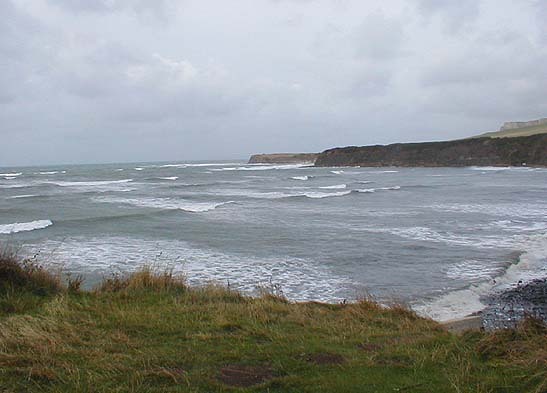 When I arrived the wind was blowing straight onshore and my pal Nigel, who was already fishing, said that although he had had a pull on his plug, there did not seem to be much about. We had a few more casts and then agreed to try from 'The Old Slipway'a couple of hundred metres along the shore. There were lots of fry in the edge but it was soon apparent that there was too much floating weed to allow spinning. So we hopped into our cars and drove along to the other side of the bay. We walked down the muddy path to find that the beach was piled high with maggot infested wrack and kelp. There were maggots in the water but the sea was rough as hell and no fish were showing. I suggested that we walked to the west where the sea was a little less turbulent. We had only gone about fifty metres when I thought I detected a swirl near the edge. We watched for a few minutes and sure enough there were a few mullet taking maggots. In fact a bit further along the fish were more numerous so we set up the fly rods, tied on small wet flies and began to fish. The fish were literally right in the curl of the waves and the sea was full of weed but by persistant casting we so it was never going to be easy. 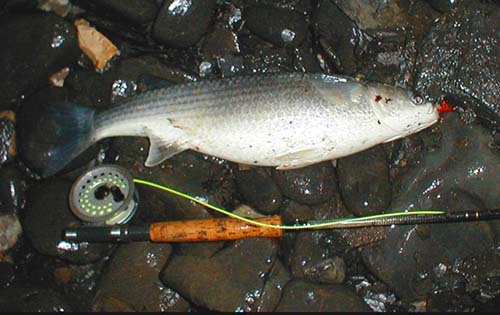 However, we eventually rewarded by a bite or two and even managed to land a decent mullet. I'm sure it would have been a fantastic evening with a bit less wind but very satisfying and well worth the three moves. The writing was on the wall as soon as we saw the white tops driving in before a southerly gale. Some spots are just too rough and weedy to fish however keen you are. 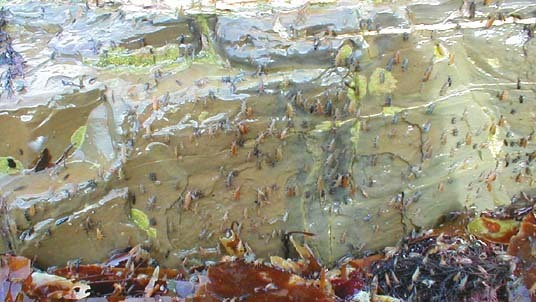 When the waves pound the shoreline beach fleas 'take to the hills' and head up the shore to avoid being washed into the sea as fish-food. Despite the pouring rain and frustrations of clearing weed from the line every other cast a big fat mullet made it all worthwhile.